Pedro Delgado, the defending champion, missed his start time with 2:40 at the prologue at the start of the 1989 Tour de France. Delgado covered the distance only 14 seconds slower than Erik Breukink, the stage winner. But adding the 2 minutes and 40 seconds at his time, he became the only defending champion to begin the race in last place, 2:54 behind Breukink. Greg LeMond surprised by placing fourth in the opening prologue. Laurent Fignon was second, Sean Kelly third with all three finishing six seconds behind the winner on the day, Erik Breukink. Delgado ended the first day of the race placed last of the 198 riders. 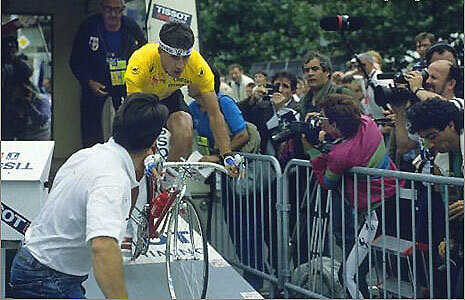 At the start of the 1989 Tour de France, the defending champion, Pedro Delgado, missed his start time at the prologue. As Delgado admitted later, that night he was very nervous and did not sleep. The following day there were two stages. The second stage was a decisive team time-trial. At the first stage, Delgado dropped, and his team did not wait him. He lost additionally 4:32. He was very weak and suffered hypoglycemia in the second stage. So after the second stage of the day, he was still at the last place in the general classification, more than seven minutes behind the best-classified of the favorites, Frenchman Laurent Fignon. Delgado rode the rest of the race very aggressively. His reaction started in the 5th stage, a 73 km individual time-trial. He was second in the stage, 24 seconds behind Greg LeMond. In the first mountain stage, Delgado attacked during the last climb, gaining 29″, but in the next stage Delgado, together with Robert Millar, finished 3:26 ahead of Fignon and 3:38 ahead of Lemond. Delgado was now 4th overall, 2:53 behind the leader, Fignon. After the 17th stage, finishing in the famous Alpe d’Huez, final victory still seemed to be possible, he was third overall, 1:55 behind Fignon and 1:29 behind Lemond. But he was too tired after riding so agressively stage after stage, Delgado exhausted, was unable to make up all the time he had lost in the early stages. The final of 1989 Tour de France was a epic battle between Laurent Fignon and Greg Lemond: Before the final time trial stage, Fignon was 50 seconds ahead of LeMond, but LeMond won by 8 seconds, it was the closest finish to a Grand Tour in cycling history. Delgado finished the Tour in third place, 3:34 behind LeMond. Video of Pedro Delgado’s Tour de France start missing @7:35.